Leaders from around the world will descend on Brisbane this week for the G20 economic forum. 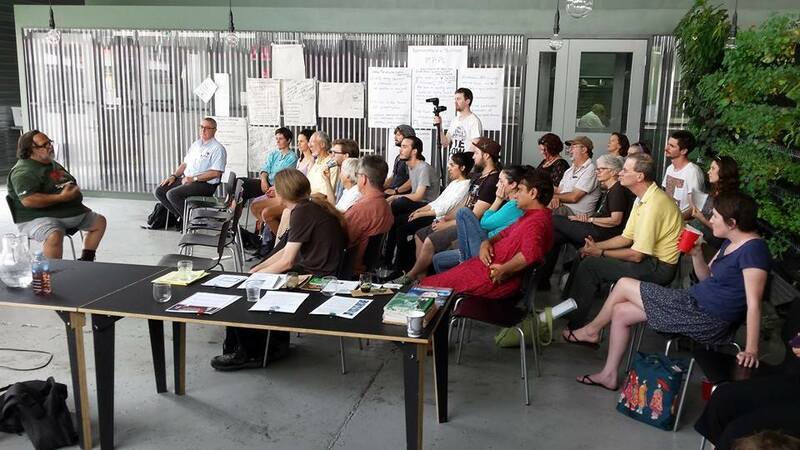 In response, people are gathering in Brisbane to hold alternative discussions about transforming society to a more just and sustainable one. 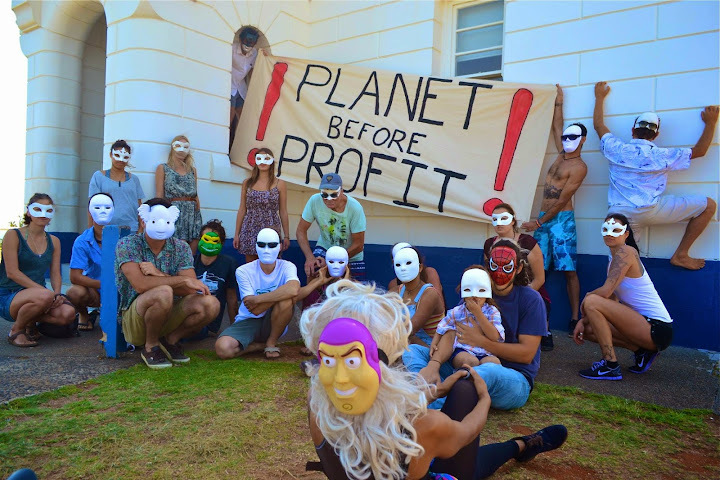 Protests will also be held against the impact the decisions made at the G20 will have on the lives of ordinary people. Green Left Weekly will be reporting on the protests and events that will take place during the week. 2:45pm Green Left publishes article about today's People's March. 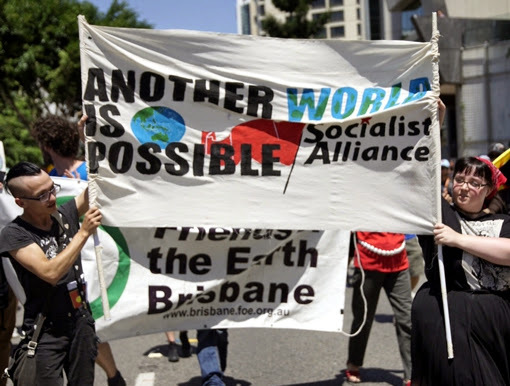 About 2000 people gathered at Roma St Forum in Brisbane for the Peoples' March against the G20 Summit on November 15. 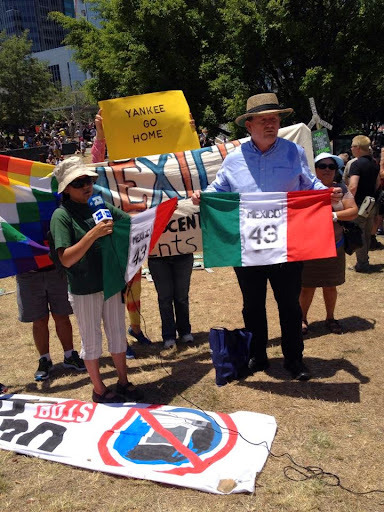 Multiple issues are being raised at the protest, including Aboriginal deaths in police custody, demand for action on climate change, support for renewable energy, and highlighting the disappearance of 43 students in Mexico, while the Mexican president is in town. 2:04pm The People's March has arrived at Musgrove Park. More activities planned. Not to late to come on down. 1:35pm Meanwhile, Byron Bay G20 occupies the lighthouse! 1:09pm Masks have been a major issue at this G20 and the protest since police are effectively banning them! 12:58pm Chants include "we are unstoppable, another world is possible" and "genocide 20". 12:39pm Last speaker starting. March should begin soon. 11:55am Adrian Skerrit from the Cloudland Collective and Briscan said: "Wealth doesn't trickle down it rushes up... think about the amount of money spent on the g20 and then think about the 15,000 people who lost their jobs in public sector... We should demand the resources of this wealthy country goes to those in need." 11:54am Over 1500 people at protest according to reports. 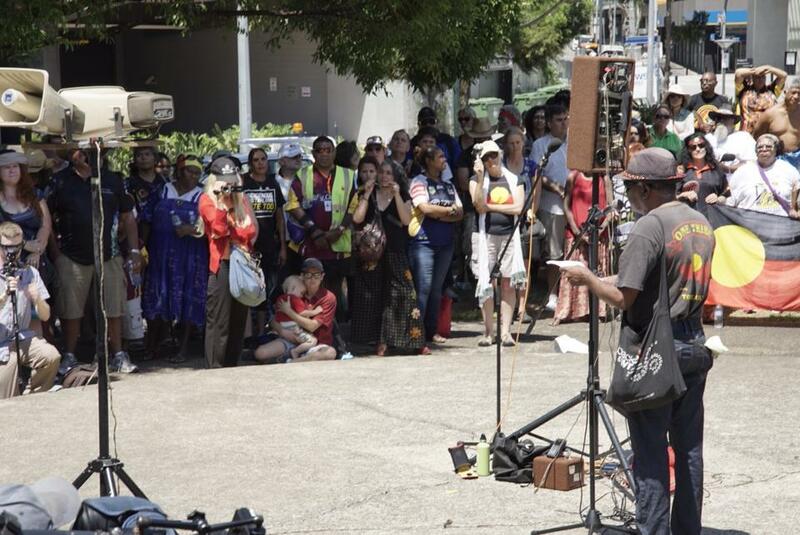 11:53am "The rich 1% have more wealth than the world's poor"
11:09am Mel Barnes reports: "Rally is getting underway at Roma St. Maybe 1000 people here so far. Aboriginal speakers are kicking off the speeches. "Aboriginal activist Callum Clay Dixon said 'What is Australia? It is a colonial state based on genocide and dispossession... The Australian flag remains drenched in the blood of our ancestors. We're not here about civil rights and equal rights, the coloniser has never been civil or right. We're here for human rights' "
"@lachiemack: Indigenous Sovereign Embassy protestors en route to Emma Miller Place #G20Brisbane #G20 @612brisbane pic.twitter.com/Fcjv4vhQ7u"
9:41am Are police preventing people from attending the protest? The protest is still happening. Activists are encouraging everyone to continue to make their way to the Roma Street Forum (Emma Miller Place) for today's protest. Security was tightened yesterday as the official G20 summit gets underway. This video shows Brisbane city in lockdown late last night. Noone was able to move for almost an hour. Many roads have been closed and the city looks like a ghost town. 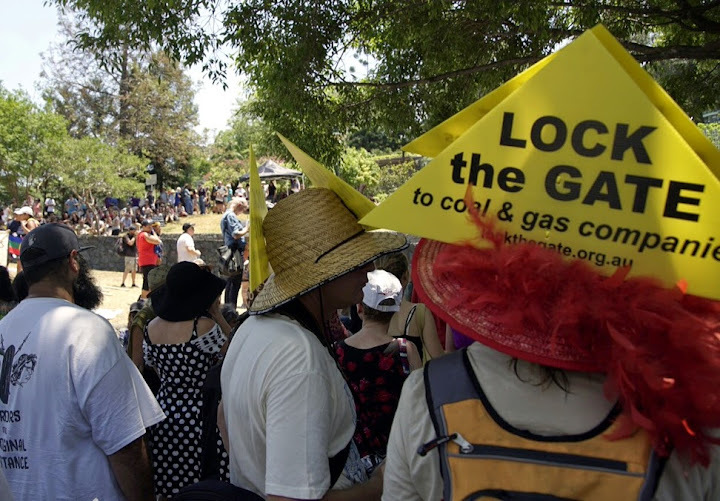 Meanwhile, yesterday hundreds protested against the lack of action on climate change taken by the G20 nations. 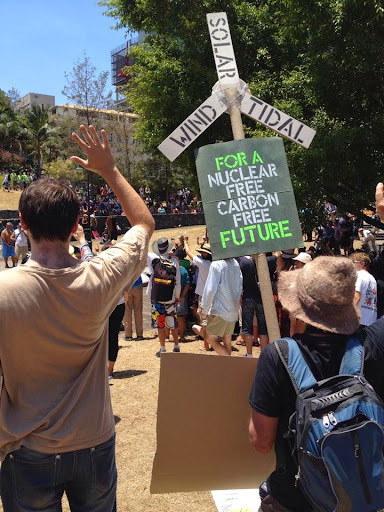 Sydney's Bondi Beach was a great place to show Tony Abbott what his Direct Action policy amounts to. Marg Gleeson is a long-time feminist and activist in Brisbane. 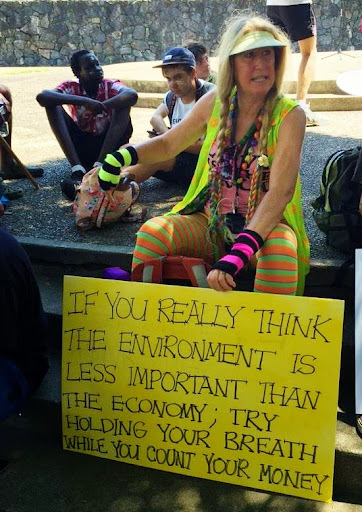 She said she is protesting against the official summit because "the G20 is the big governments, the big economies, pushing the neoliberal agenda of privatisation, austerity and service cuts. 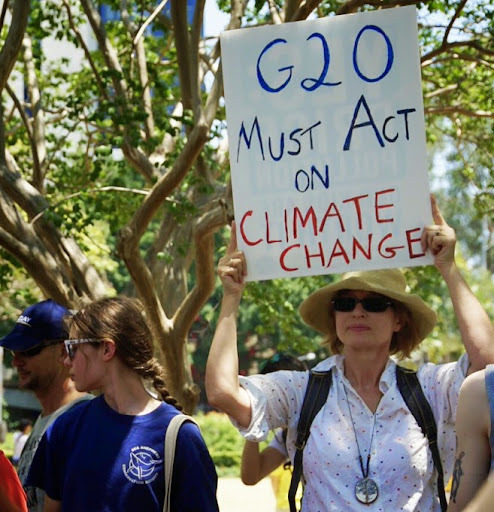 "I can’t see anything coming out of the G20 that will address the fundamental issue facing the world at the moment, which is climate change." 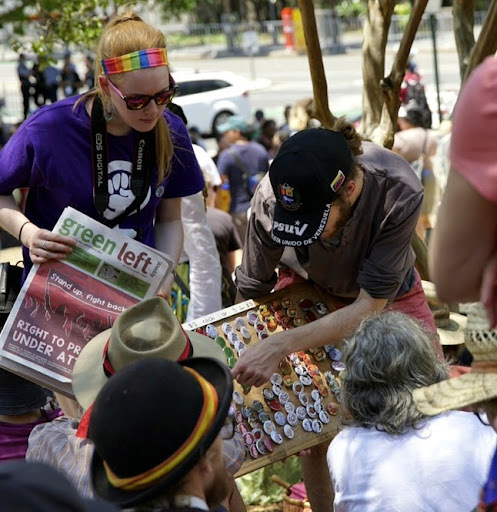 Gleeson is a member of the Australian Venezuelan Solidarity Network and presented a workshop at the peoples' summit about how countries in Latin America are experimenting with alternative trading models based on cooperation and fair trade. 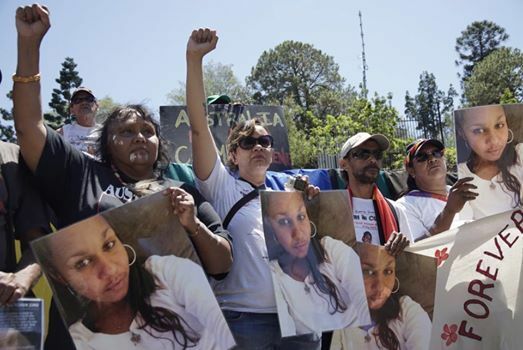 "Countries of Latin America have shown they’ve had enough of [neoliberalism]. That agenda doesn’t meet their needs compared to the regional arrangements that the Latin American governments are involved in, such as [the trading blocs of] ALBA and CELAC." Gleeson is also concerned new security laws that were introduced for the summit could be used against people. Four people have already been notified by police that they are prohibited from entering declared areas during the summit, and will not be allowed to protest. These bans are preemptive and not based on offences they have committed. 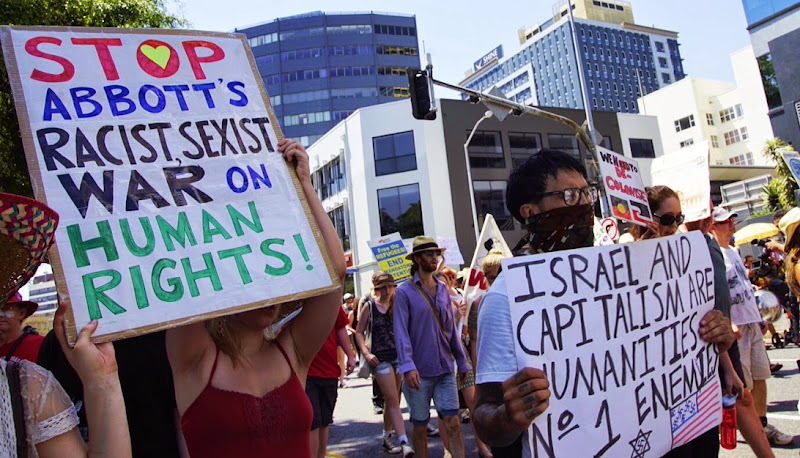 "The “terror” laws, which restrict our civil liberties, and the special laws that have been brought in for the G20 in Brisbane, they won’t be removed from the books," Gleeson said. "They’ll stay and they will be used against workers when eventually there are strong movements against the austerity drives by this government. So it’s setting the scene for future attacks on the popular movement." 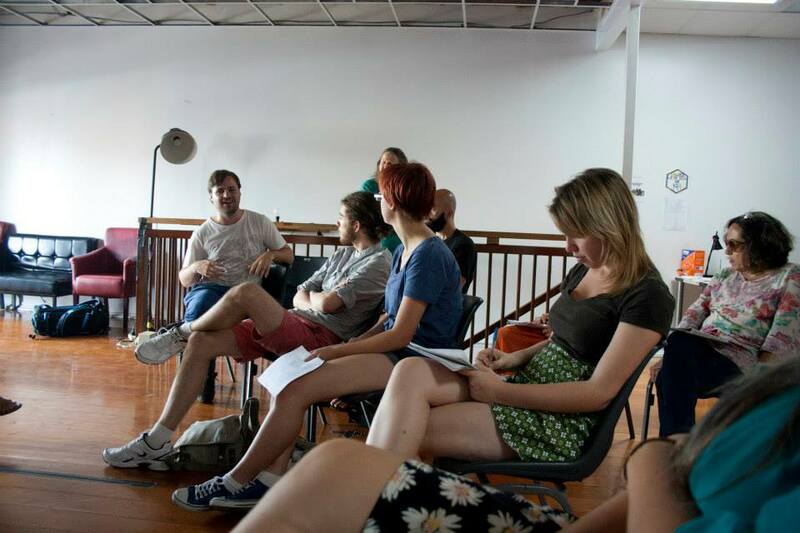 A workshop at the peoples summit discussed how public private partnerships is another name for the privatisation of public assets, which makes ordinary people pay more for basic services such as water and electricity. This interview with the presenters explains why the G20 is pushing this policy. 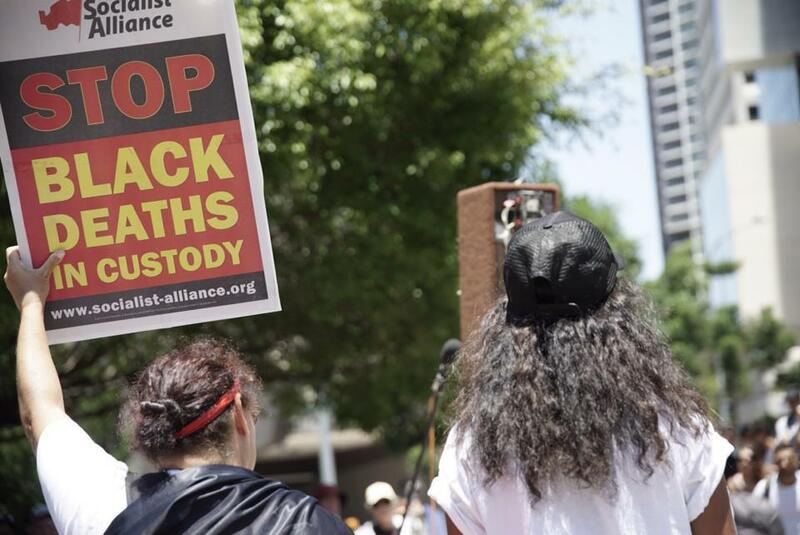 About 400 people gathered in Roma Street Forum on November 14 to protest against continuing Black deaths in custody. Protesters marched to Musgrave Park in West End with a heavy police presence. Police blocking media access to Aboriginal protest. Listening to the effects of public private partnerships in India. Some people can fill a swimming pool with water while others can't afford a glass of fresh water. 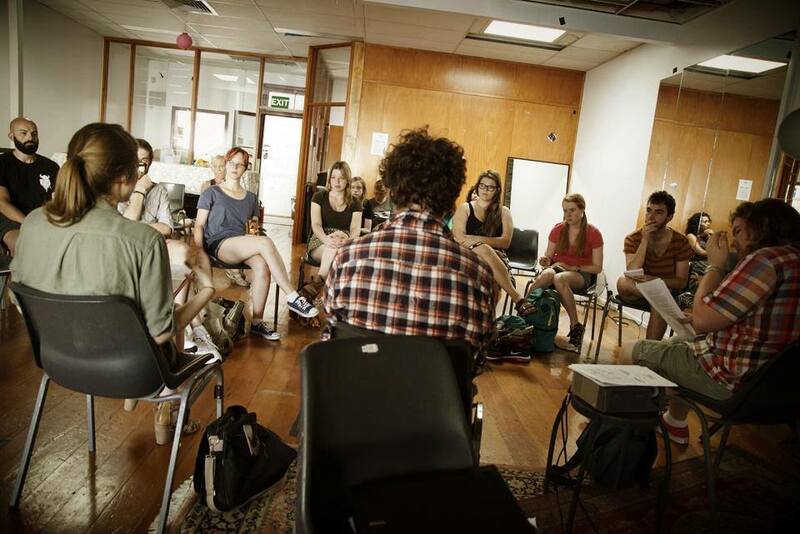 Deep in discussion about how capitalism is destroying the environment and the case for an eco-socialist revolution. Crowd for Gar Alperovitz "Alternative Economics & The Pluralist Commonwealth". Aboriginal Elder Sam Watson speaks about speak about the history of Aboriginal struggle in Australia and how to make social change. 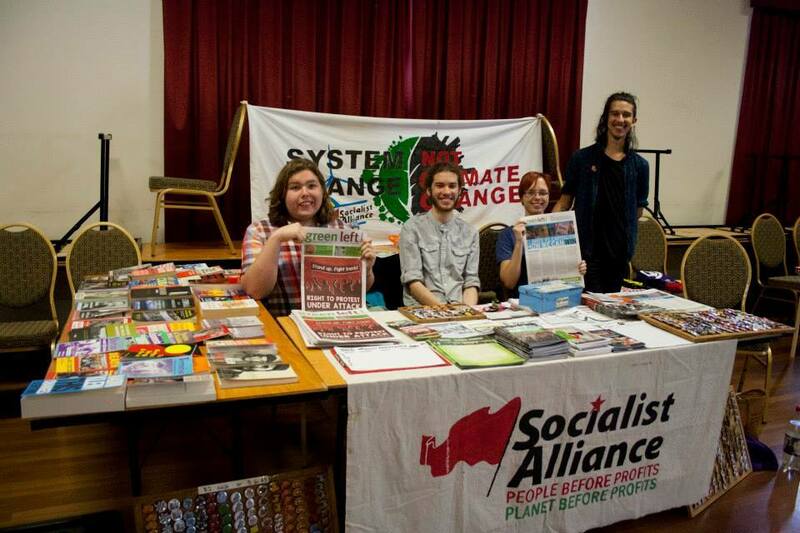 Stalls at the peoples' summit. 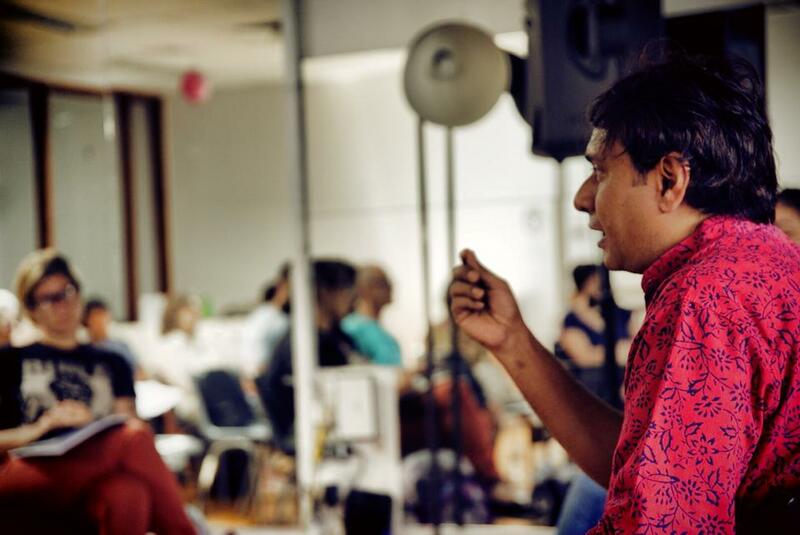 Organised by the Brisbane Community Action Network, "Visioning Another World: The G20 Peoples Summit" is a three-day festival of workshops, creative activities, education and action. It is a stark contrast to the undemocratic discussions taking place behind closed doors in the official summit. Speakers at the people's summit include the general secretary of the International Trade Union Confederation Sharan Burrow, Friends of the Earth campaigner Sam Castro, OXFAM campaigner Winnie Byanyima, National Congress of Australia’s First People representative Lez Malezer, AFTINET convener Pat Renald, Greens Senator Larissa Waters and Lex Wotton from Palm Island. The people's summit will be followed by a rally and march on November 15. Jennifer Natoli gave a workshop on the accelerating problem of governments and corporations buying large tracts of land in developing countries to cultivate agrofuels and monocrops. Farmers are being forced off their land and in response, resistance movements have arisen to demand control over their food and land. Eulalia Reyes-Whitey and Margaret Gleeson looked at the model of trade being used in Latin America and Caribbean known as ALBA. ALBA, the Bolivarian Alliance for the People of America, was initially proposed by Venezuela president Hugo Chavez in 2004, and backed by the Cuban government, to counter the neoliberal model of development favoured by the US. Aboriginal people and their supporters began a week of protests, meetings and ceremonies on November 9 in response to the G20 "leaders' summit". They aimed to highlight the issues still facing Aboriginal people under the slogan of “Decolonization before profit!” as well as presenting Aboriginal solutions to these problems. Kooma man and Brisbane Aboriginal Sovereign Embassy organiser Wayne Wharton said: “Today our kids are being removed at rates that dwarf the stolen generation, our people are imprisoned at five times that of blacks in apartheid South Africa, our people are still being murdered by police who get away unpunished, our young people have the world's highest suicide rate and our sacred lands and places are being destroyed and poisoned by mining. 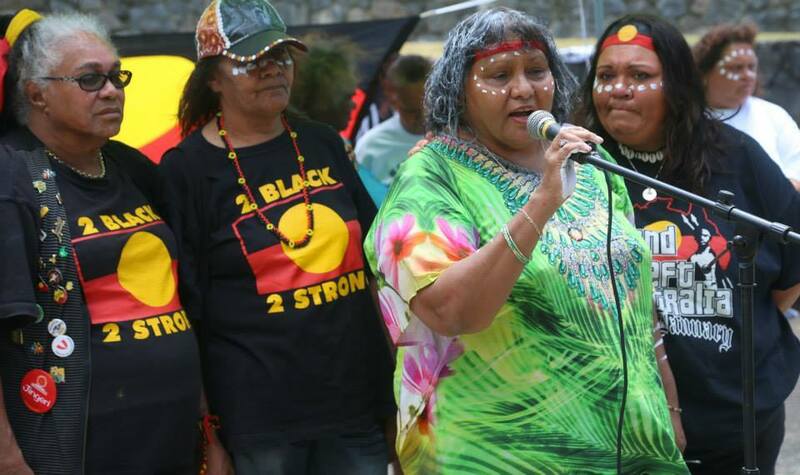 "All this while the Australian government and much of settler society refuse to face the fact that this continent has been stolen from First Nations. 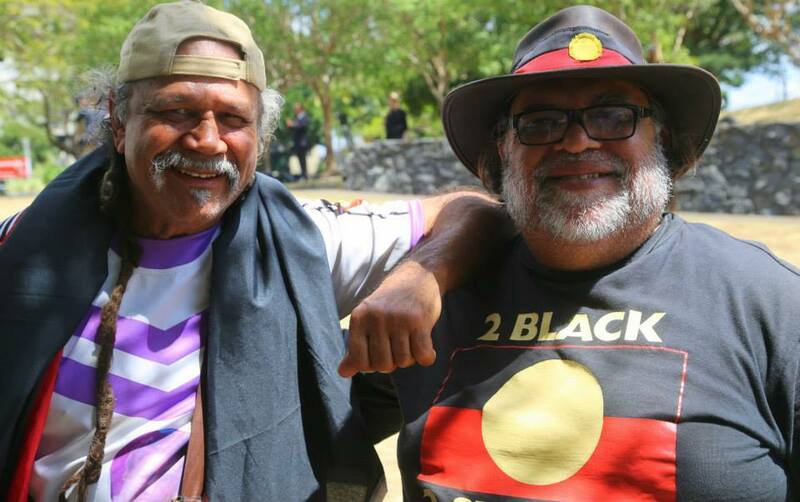 How can mature dialogue on the way forward begin when most Australians don't even know what has happened and what is happening to Aboriginal people?" 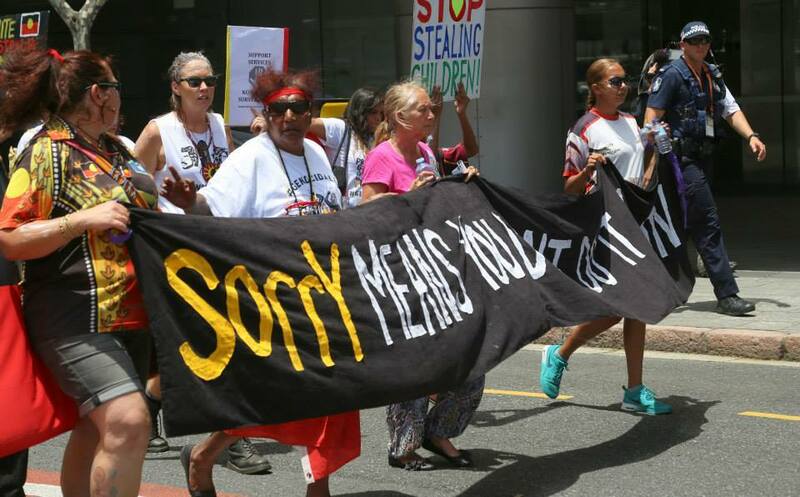 A rally to stop the continuing stolen generation was held on November 10. 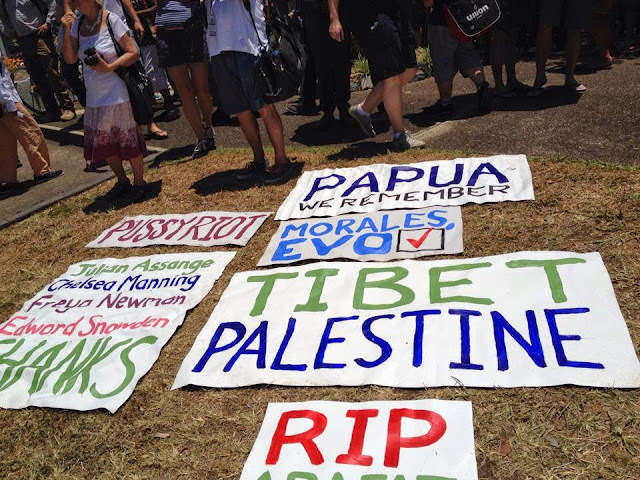 More than 100 people marched through Brisbane city and ended at Musgrave Park at South Brisbane. 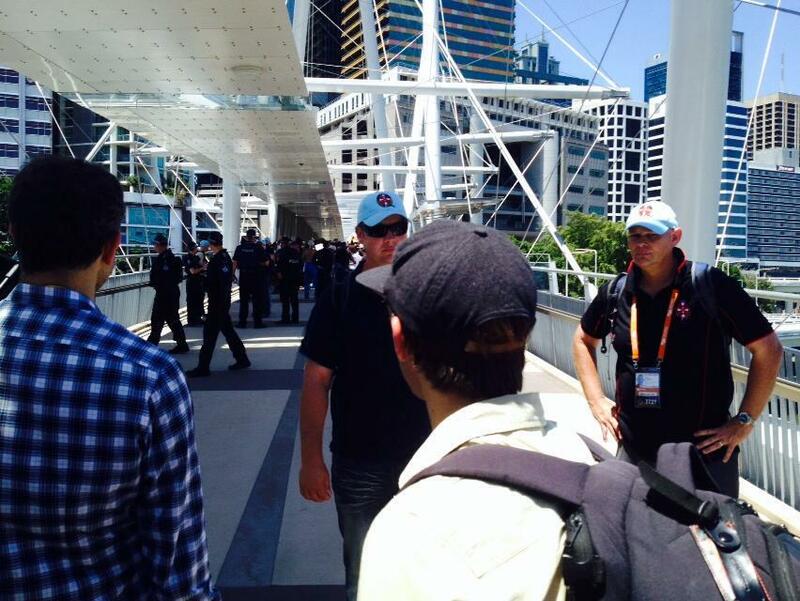 Protest organisers said they wanted international media at the G20 to report on issues facing Aboriginal people. One of the biggest issues is that Aboriginal children are being removed from their families at a higher rate than ever before. 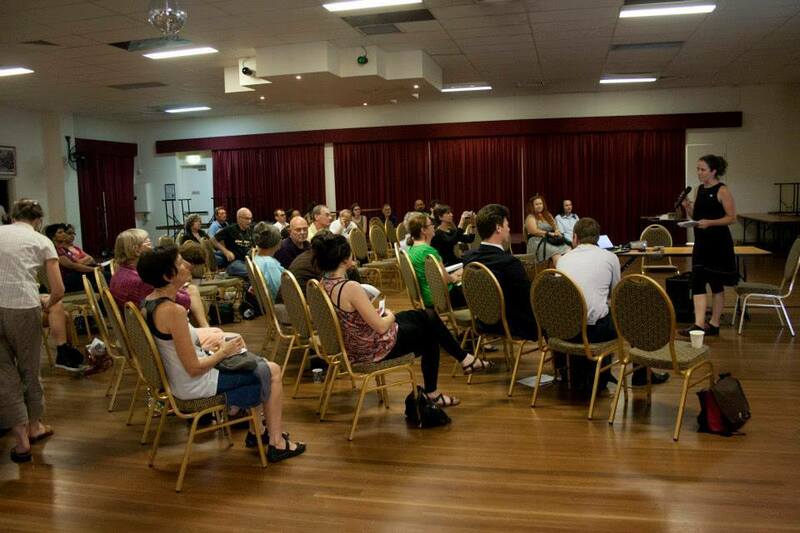 Photo: Brisbane Aboriginal Sovereign Embassy/Facebook.